Part of the fun to making a bucket list is getting to check things off the list. Although we have checked a few things off our family bucket list, the one I completed last week was a long time coming. A year to be exact. Ironically, I took the final sunset picture on my birthday. With the help of doing Sunset Sunday for a few months, which kept me on track, I was able to take a picture of the sunset every month. The goal was just one picture of the sunset each month, but I got hooked and often took one a week. Sunsets are so beautiful and after completing this family bucket list item I have learned that it is true - no two sunsets are the same. 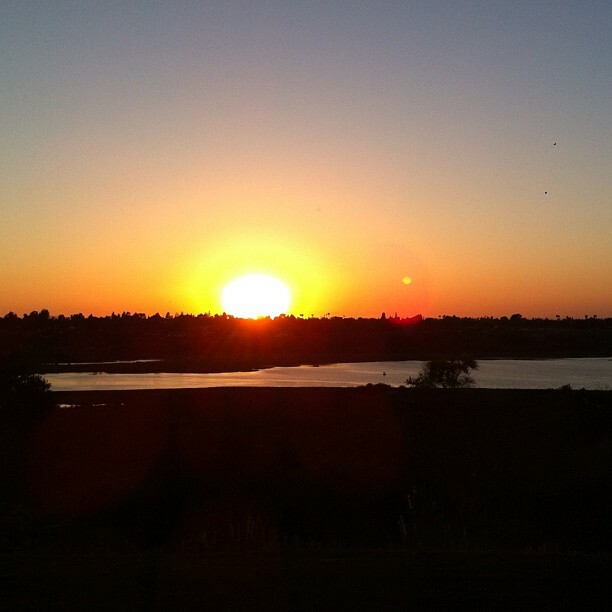 One of my favorite sunsets was in September overlooking the Back Bay, also know as the Upper Newport Bay. The colors were phenomenal and I was truly thankful to have my iPhone that day. Another favorite was when the skies turned bright pink. I was walking the track at the local high school and looked up to see a sky filled with cotton candy clouds. Although beautiful sunsets are associated with summer and tropical islands, I will admit that winter sunsets aren't too shabby. Oh, and when the golden hour ends ... be patient and wait for the magic moment that occurs just as the day is ending and the night is beginning.